Lake Sevan is the largest lake in Armenia and one of the largest high-altitude lakes in the world. It's one of the most favorable places for us, Armenians in summer. 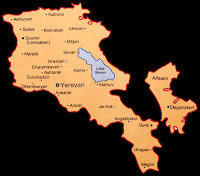 It's close to Yerevan (the first beaches can be reached in less than half an hour). In the beginning of 20th century the Soviet government decided to lower the lake's level and use the water for irrigation and hydroelectricity which led to almost an ecological disaster. The island where the Sevanavank monastery was situated, transformed into a peninsula. In the recent years, the government of Armenia started to implement a plan for increasing the lake's level to recover its ecology. Its results can be now noticed almost everywhere in the shores of the lake where many of the trees and constructions have gone underwater. People usually organize daily trips to the lake shore, making a picnic with the required BBQ making on the spot. It usually takes some days to organize those trips since the meat and stuff should be bought beforehand and the meat should be prepared for BBQing (the process is called "to make a basturma from the meat") one day before. To me, it's an unnecessary bustle and it's better to go there with just some prepared sandwiches, plus fruits and vegetables, meanwhile to many, those trips are mainly for eating the BBQ :( And I'm not telling about the competition most of the male Armenians participate in. It's for the best "basturma" and BBQ making. The weather was pleasant at first and it was even cloudy that's good for our protection from the sun. Oh and about the sun at Sevan. Since the lake is situated on a high-altitude in mountains, the sun is particularly strong there and one can get burnt in minutes, thus the long-sleeved shirts, hats and sun blocks are required. I enjoyed taking photos there and as you see in the photos below, the lake looks amazingly cool. Most of the comments in Facebook and Flickr on these photos point that you can see these views far not every day there. I am the VP of the Armenian Engineers & Scientists of America and the administrator of the blog. Our efforts are for a very worthy cause. I am very impressed by your pictures of Sevan and would like to get your permission of including them on the blog. You have my permission to use the photos for your project blog.